I have been out West on vacation this week and finally have a moment to post this cake I made during the last (and hopefully final) snowstorm of the winter in New York. I am calling it a winter cake but you could easily substitute any other fruit for the citrus and it would be just as tasty. I am thinking strawberries in the summer. 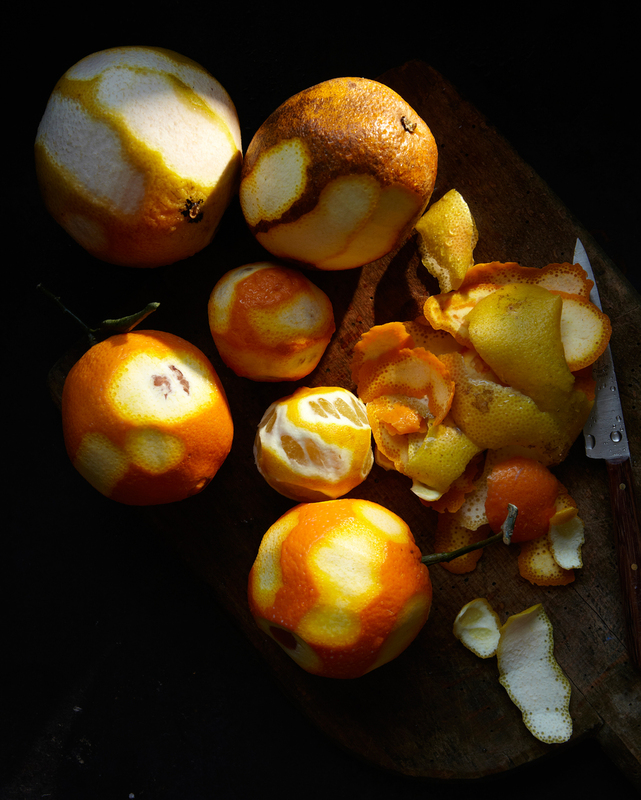 I love winter citrus. It is always a bright spot long about February when the days seem as though they might never get longer. I was inspired to make this cake while working in San Francisco this past January. In the mornings before heading to the studio we always made a stop at Tartine. One morning we decided to cheat on Tartine and try a new place calledCraftsmen & Wolves just down the block from Tartine. It has a sleeker vibe than Tartineand at first I wasn't sure about all the pastries carefully and purposefully lined up behind the glass. We ordered a scotch egg and a small coffee cake with candied citrus and espresso topping. Needless to say they were both stellar. So this is my attempt at recreating that cake. My heart is still with Tartine, their ham and cheese croissant is out of this world. I am a savory person in the morning more so than sweet. I think that is why this cake appealed to me in the first place with it’s salty espresso top and the bitter citrus inside. If you find yourself in San Francisco, you must try both places, neither will disappoint. I used a recipe from Martha Stewart for the candied citrus peels, as I had never made them before. This recipe seemed straightforward and simple. You can use any citrus you want. I used a variety of pink grapefruit, blood orange, bergamot lemon etc. Scrub the citrus well to remove any residue. With a sharp paring knife, slice off ends of grapefruits, oranges, or lemons. Following curve of fruit cut away outermost peel, leaving most of the white pith on fruit. Slice peel lengthwise into 1/4-inch-wide strips. In a medium pot of boiling water, (enough to generously cover the peels) cook the peels until tender, about 10 minutes. With a slotted spoon, transfer peel to a wire rack set over a rimmed baking sheet; spread in a single layer to dry slightly, about 15 minutes. While the candied citrus is cooling make the batter. The 2 cups of candied citrus peel and gently mix in by hand. Slowly add the dry ingredients to the wet until just combined. Combine all ingredients for the topping in a bowl and mix by hand with your fingers until the topping has the texture of cornmeal. Bake at 350 degrees for 45 minutes; or until done. The beautiful ceramics used in this story are from West Coast artist Jessica Niello. I picked them up in San Francisco at The Perish Trust.